I postponed the last two Links of the Week posts because I have been busy working on another project and really have had time to do much blog post reading. When I go blog reading I do it in blocks of time measuring in hours. I have not had the time in large enough blocks recently to do that. However, I have come to realize that Google+ is full of awesome stuff. The links below have been mostly (almost entirely, actually) drawn from links thrown to me by people in my circles over the last two or three weeks. Because I haven’t posted in a couple of weeks, the list of links is getting stupidly big. Not only do I have a lot of links, I want to say (or show) so much about them. I’m deviating even farther from my normal routine and posting this Thursday night, because if I wait until Monday it’ll just be worse. There will probably be no Links of the Week on Monday, but I hope to have another announcement. 22 rules for storytelling, according to Pixar storyboard artist Emma Coats. When I design a scenario, I’m not trying to plot a story. However, the resolution of the scenario should result in a story. Many of the rules here can be applied to good result. For instance. When designing a scenario I don’t necessarily know where it’s going to end. I try to weave my scenarios together to some extent, so sometimes my players just ‘pass through’ a scenario. However, there are elements of scenarios that can be considered important enough to be treated much as ‘endings’, and a really good thing about them is that if the party fails, that still resolves the scenario and they got to experience ‘the best part’. Make it big, and make it exciting. Well… I’ll note the first thing that comes to mind, but I don’t get attached to it because I’m reasonably certain something will come up soon that will be better. As above, not all apply directly as written, but even when they don’t you can decide to not follow them. Added to the Hall of Fame under Writing Guidelines and Tools. I would like to thank Alex Schroeder for mentioning Paratime Design in a thread on Google+. Alex’s link was to some Creative Commons Licensed Cartography. This page has links to galleries with dozens of maps in various styles and subjects. I had never heard of them before, but I’ll be taking a closer look sometime soon. Added to the Hall of Fame under Cartography and Maps. Added to the Hall of Fame under Setting Design. No so much blog reading as usual, but a few recent posts have come to my attention. Fictivite compares and contrasts Fictive Hack and Old School Hack. I’m looking forward to seeing the finished product. FrDave continues his layout experiment. I really like how this is starting to look, though I am mildly — only mildly — concerned that he may run out of room given the current presentation. Overall though, I think it works. Until now I would not have thought anyone would need descriptions of 600 different ioun stones, but Courtney found someone who had, and had packaged the entire thing into a 104-page PDF. Monica Valentinelli writes about a new “test” for female characters involving cats. I understand the context in which the idea for the post comes up, but I think the test applies to any character. And can probably be expanded to other story elements. Pick a story. Any story. Take the characters you think are weak and replace them with an “animated prop,” which in my case is cats. If the story does not break, then that character needs some loving care. I don’t think I’ve ever seen writing advice that simply and clearly put. Now, some characters are and should be weak; in movies they are called ‘extras’, in fighting games they might be called ‘minions’ or ‘mooks’. Significant characters really, really should have more to them than that, and this is a simply-applied test. Richard talks about burning brains, a very Mythos way of making use of sentient brains. Creepy and disturbing, the way it should be. It might also work for a Girl Genius-style spark, I can easily imagine one who explores the use and application of jarred brains. Sparks tend to not be particular squeamish about these sorts of things, I have noticed, and totally lack a sense of proportion when Science is involved, or a problem. Dammit Kickstarter, you’re getting me in trouble again. He is now also offering “The Quartet”, pages of PennyGems in green, red, blue, and yellow. And the “Auxiliary Set” — same symbols as the Primary Set, though with a contrasting dot in the center of each symbol and in pastel colors (gray, pink, peach, champagne, chartreuse, cyan, lavender, and brown). And the Damage Set, black with each side having one or two drops of red on them. And the Dichotomy Set, simply black and silver on opposite sides, with ‘notches’ printed on them so they don’t get confused with the base silver and black PennyGems. And finally, JumboGems, the same colors as the Primary or Auxiliary sets, but sized to fit quarters instead of pennies. This is a short project, closing Friday July 27, so you’ll have to move. It is already 2,806/2,500 funded, and I’m likely to push that up pretty hard myself. 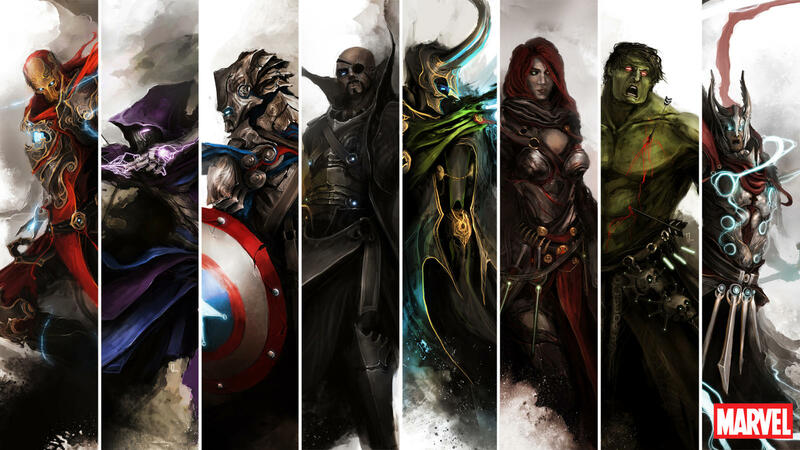 theDURRRRIAN at deviantArt did a series reimagining the Avengers in a fantasy style inspired by games, especially Guild Wars 2. I think I don’t want to cross any of them. The composite shown here consists of vertical slices taken from full images of each character, linked to from the deviantArt page. The Lunar and Planetary Institute has a set of ‘boots on the ground’ panoramic images from the moon stitched together from individual 70mm Hasselblad frames. This is the first time I’ve seen footprints on the moon. This is so cool. 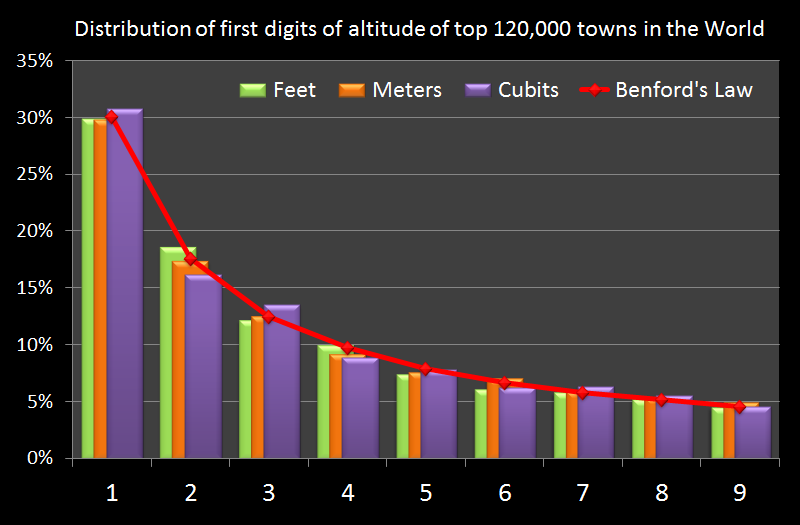 I have to reread this article on Benford’s Law to make sure I understand the math. Right now my mind is blown. Perhaps the graph shown below will make it clear why — this is some trippy stuff, and I don’t fully understand the math behind it yet. I definitely have to go back and reread this. Apparently Great Britain used to be ‘greater’ — or at least contain more land. 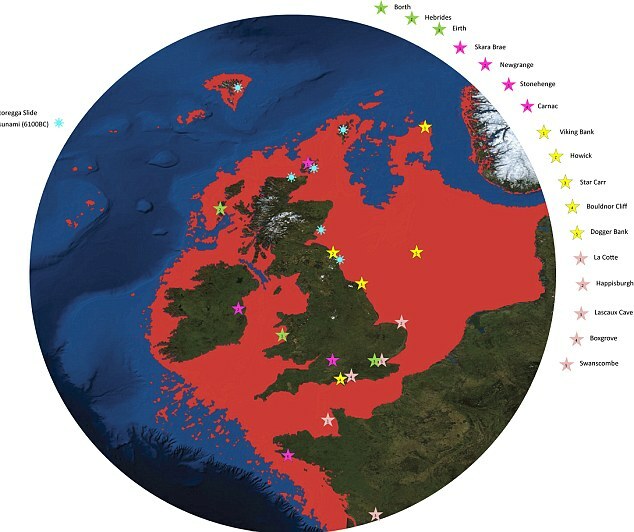 Scientists, guided by information from oil company surveys, think they have found “Britain’s Atlantis”, a huge undersea kingdom swallowed by the sea in 6,500 BC. According to research done after oil companies have passed along survey data, it appears that Britain is basically what’s left after the water rose (or the earth subsided; I’m not sure which it actually is). It seems there was a lot more land around there, back in the day. The Earth changes over time, quite a lot. It is estimated this happened largely 8,500 years ago, which is a long time to you and me but not very much time at all to the planet. 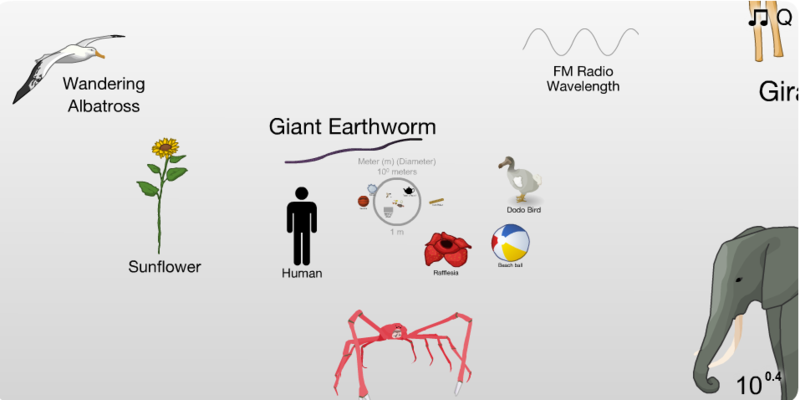 Randall Munroe has done static images of this sort of thing, but this Scale of the Universe 2 Flash application by Cary and Michael Huang is explorable. Zoom in, zoom out, get a bit of information about each entity presented. From (what I find) unimaginably small to unimaginably big, with examples at each step that we know or posit the existence of something. At Hackerfriendly they built a Tesla Gun. A hand-held, battery powered lightning machine. This thing excites me strangely. I don’t have an actual use for it, it’s totally impractical… and I really, really want one. Thankfully, they provide some general instructions on how to build one. That uses tools and resources I do not have easy access to. This is probably a very, very good thing. This fan video did a pretty good job of capturing how I see Deadpool. Broken. Very Broken. … but it was still cool to watch. An amusing statistical breakdown (well, lots of charts) of Song of Ice and Fire. I don’t know where he got his numbers, but the opinion-oriented ones can probably be trusted (he should know how much he cares about what someone ate), the rest are probably made up but sound plausible. Though I’m not sure about the ‘favorite male character’ question. Odds are good it’s true, but there is an alternative that is probably as likely correct. This looks remarkably cool too. Doesn’t make my jaw drop like The Gate or The Silent City (both below) did, but I’d like to know more. I don’t know if I’ll go to see it — I am very, very bad at watching movies and TV shows — but the premise seems a good one. [I say ‘like’, that’s who they are.] — at PaizoCon end up reminiscing about their time working at TSR. I really enjoyed listening to this, it really paints a picture of TSR back in the day. As stated, this is a short film. It is quite well done… but it’s not for the squeamish. If you have difficulty with mutated humans, including the mutations happening, you may not want to watch this film. On the other hand, if you like to read The SCP Foundation, this video is very much something you’ll probably want to see. “Certain long-redundant gene sequences were becoming active”. The video is primarily of a debriefing of the situation, interleaved with video of the actual events the debriefing is discussing. Freaky. Bu quite well done. Such a dispassionate description of what is shown in the video. One definitely not for the kids. I probably won’t watch this in the theatre, but there is a good chance I will remember to find this one when it comes out on DVD. Demonstrates remarkable levels of badass… there is a chance this will slide into the realm of cheese, but there appears to be a great deal to be mined here. I can say that I would want to live in a post-apocalyptic world. This one is hard enough. But I do appreciate well-done movies about them. Another disturbing video. Not as downright creepy as The Gate, above, but in some ways more credibly worrisome. Visualization can be a powerful tool when applied well. I think I have seen pretty much all of these. It is a big part of the reason large swathes of YouTube are completely free of my presence.